Dress up Moana, the "taupou", or Chief's daughter of the mythical Polynesian island of Motunui. 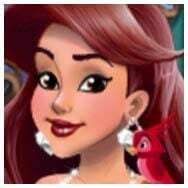 Loosely based on the animated Disney film, and Polynesian cultures, especially those of Samoa and Tonga, this dress up game lets you create strong and beautiful female characters. You can layer gorgeous clothing, made of tapa cloth, feathers, leaves, and other natural materials. Top your skirts off with a kiekie, or fancy belt. Adorn Disney Princess Moana with feathers, flowers and pearls. Choose from a wide assortment of necklaces, such as leis made of orchids or chilis! Use the backgrounds to recreate iconic scenes from the movie, such as Moana walking among the waves, sailing on her canoe, discovering that her ancestors were voyagers, or diving down to the land of monsters. @dolldivine, it really depends on which Polynesian country it comes from. I know Moana has some elements relating to the MÄori from New Zealand. I come from New Zealand and we had a MÄori King. If you have the hair draggies set to an option other than front and then try the normal draggies, it will place it on the layer you placed your last hair draggie. I'm so happy this is done! I was gone for 8 days and the work you did in that amount of time is amazing! This is such a pretty game with such pretty items! I love it!! Wow, this got done quick. Really digging the hair draggies!